I have a double giveaway going on here. 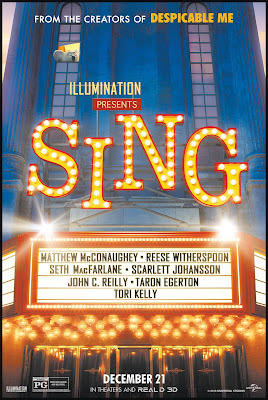 I have 25 pairs of passes to the December 19th screening of SING at the AMC Boston Common to giveaway. In addition, I have a prize pack of SING related items to giveaway that is not geographically limited. Feel free to enter for one or both. The passes are given away directly by the PR company for the movie. You'll be filling out your information on a form on their website. Please leave the name Java John Z's as the site from which you are signing up. The movie is 7pm on Monday 12/19 at the AMC Boston Common on Tremont. I was just at this theater to see the Rogue One preview I just reviewed. I thought I saw a sign about validated parking for the Millennium Place Garage but I don't recall if it was $5 off or $5 parking. The second giveaway is for a prize pack related to the movie SING, arriving in theaters December 21st. There will be two winners. The prize pack includes a SING tote bag, a pair of headphones, and some pencil toppers. Illumination has captivated audiences all over the world with the beloved hits Despicable Me, Dr. Seuss’ The Lorax, Despicable Me 2, and Minions, now the second-highest-grossing animated movie in history. 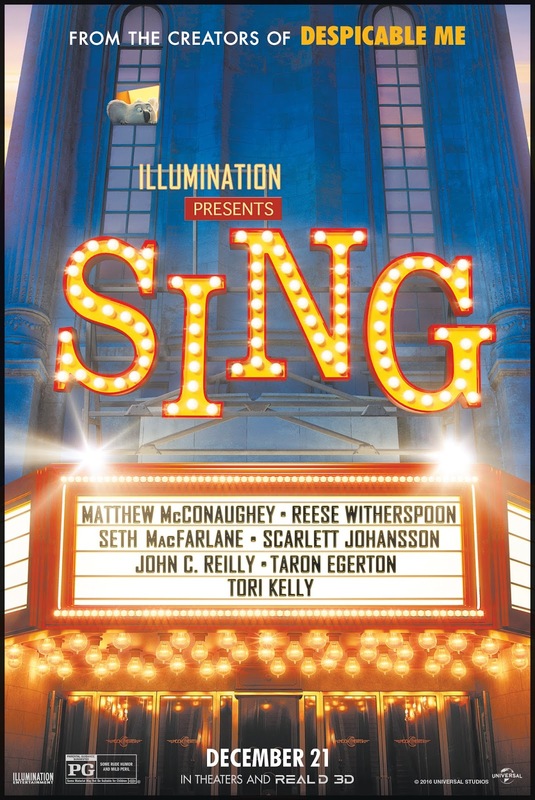 Following the release of this summer’s comedy blockbuster The Secret Life of Pets, Illumination presents Sing this holiday season. Again, The giveaway is for a prize pack related to the movie SING, arriving in theaters December 21st. There will be two winners. Open to US residents who are 18+, you have through 11:59pm EST on 12/21/16 to enter. Good luck. I saw the Secret life of pets and the Minions/Despicable me. We have seen the secret life of pets. I like the character actions. We are pet lovers. Our family has seen minions and the secret life of pets. The kids loved both of them and laughed the whole time! I have not seen any this one would be my first. Would love the chance. I've seen the minions movie, and I like that they are family oriented. We saw the secret life of pets. The movie was kid friendly and so entertaining. I haven't seen any of these movies yet. I can't wait to see this one it looks really cute. I have seen The Secret Life of Pets and absolutely loved it! I loved cute characters, especially Gidget and Chloe the cat. I want to watch Secret Life of Pets - I think my kids would love that movie. I loved the Minions movies.. so funny and well made with such lovable characters! I can't wait to see Sing and The Secret Life of Pets! I have seen Despicable Me and I love them because they are so funny!